Temples - South Korea History And Culture Come Alive. Temples play a huge part in South Korea history and Korea tourism just does not seem complete without a mention or exploration of the many beautiful and serene religious places in the country. It is good to get an overview as well as a comprehensive insight into the religions practiced in the country. Incidentally, these religions are more than mere beliefs and have evolved into philosophies deeply embedded into the culture and heritage of the country. 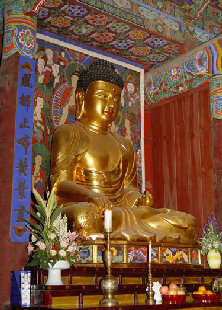 Baegyangsa and Hwaeomsa are considered head temples of the Jogye Order of Korean Buddhism. In South Korea, you will find Buddhist centers like Beopjusa or Haeinsa , which is listed as UNESCO World Heritage in 1995 to Catholic sites protecting the respective resources and relics of the religious evolution in the country. Korean Buddhism grew into prominence as a religious philosophy soon after Buddhism made its first imprints in the Korean society. Today, a study of Korean history and culture remains untrodden without exploration of Korean Buddhism. You will spot various relics of Buddhism and its heritage in the buildings in Baekdamsa , Baengnyeonsa and Cheongnyangsa built under the Silla Dynasty, sculptures, paintings and handicraft works spread across the country. However, the religious topography of South Korea also consists of three most dominant of religions - Catholicism, Protestantism, and Buddhism. Myeong-dong Cathedral and Cheon-dong Cathedral can give you an insight into the Catholic locales like Jeoldusan Martyrs' Shrine in Seoul and Martyrs' Mountain (Chimyeongjasan). Interestingly enough, whether these are Buddhist relics, Catholic resources or Protestant heritage, the culture of Korean society have efficiently imbibed these religious dictums in South Korea to evolve into an intellectually rich society. Bongeunsa and Jogyesa in Seoul even offer "Temple-Stay Programs" to the visitor, an alternative to hotels, if you so desire - so that you can get a feel of the spread of Buddhist cultures like Chamseon, Dado, and Balugongyang by living a life of a monk for a few hours. Attend these informative programs on the religious values to complete your cultural tour of South Korea.